The 1st weekend in December has become the traditional weekend for the Irish National Short Course Championships. Held in Lisburn each year this is the 1st opportunity for National level swimmers to sound out where they are in ralation to their end of season form. With no qualification places up for grabs for either National age groups or International teams, the importance of this meet in the national calendar has deminished over the last few years making it a ‘swim through’ meet for the vast majority. Ryan Lewis opened up the proceedings with a PB in the 50 Free, a feat he matched half an hour later in the 100Fly. 2 PBs from 2 swims on day 1 cant ask for much more than that. Chloe McKay and Amy McCullough both opened their accounts with PB swims in the 100 Free while Erin and Amy Barr got off 2 a solid start in the 100BRS. Danielle, having complefed 45k in the pool this week and been in the gym last night, is truly unrested, but managed to make the final of the 50BC and the B Final of the 100 free. Amy Barr rounded off the Morning session with another PB, in the 800 Free this time. The Finals session on Day 1 and Danielle did what wmshe does best and raced incredibly well breakng her own Ulster Senior Record becoming the 1st female to go under 29 seconds. She also swam a lifetime best on 56.99 in the 100 winning the B final comfortably. The 2nd day of racing got underway with the womens 50FS and Danielle picked up where she left off the night before with the fastest time of the heats. Chloe McKay swam a lifetime best of 28.4 while Amy Barr repeated her best time again. Ryan continues to progress in the fly with a 6 sec PB in the 200 just missing out on a final swim. Sinead got her Irish Short Course up and running in the 100FLY qualifying for the finals session in the process. Lorcan smashed his 50BC PB bypassing 29 seconds completely going from 30.e to a 28.8 and again just missed out on a final place. Danielle completed her mornings efforts with a fastest qualifyer spot into the 200BC lowering her lifetime best in the process. The morning session was brought to a close by Amy and Erin Barr and Amy McCullough who all produced best times in the 400FS. Finals sessions and Danielle swims 50 FS and 200BC within 10 minutes of each other claiming a Silver and a Gold respectively, on both occasions matchingbher best times coming into the meet. 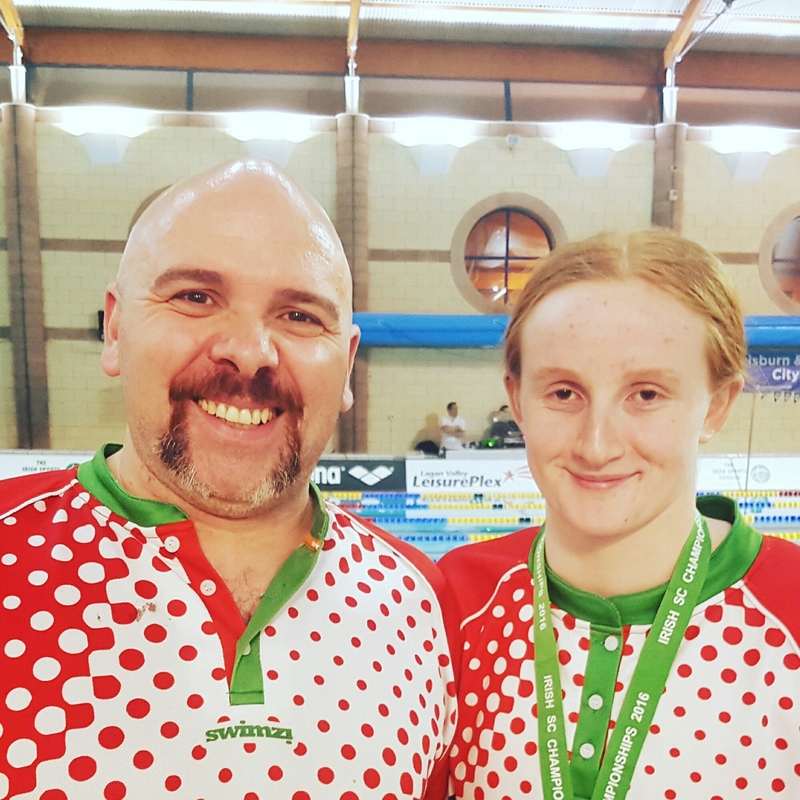 Amy and Erin Barr completed their Irish Short Course weekend with solid swims in the 200BrS whil Jan Manillili produced a 4 second best in his 1st ever meet at this level. The last session in a tough week gets underway with Danielle deciding to compete in both the 200FS and 100BC. If your gonna finish you may as well finish strong and that is exactly what Danielle did this weekend. 2 silver medals in the final session first a 6 second PB in the 200Free missing out on the Gold by less the 2 tenths of a second in a fantastic race with Lisburns Rachel Bethel then 8 minutes later a 2nd silver coming in the 100BC. A fantastic weekend of ‘racing tired’ from the whole team.